Below is the beginning of my tombstones and props for Halloween 2019. Right now, I have a few pictured, but I'm planning to do eight. I'll post them as I get the concept and the build complete. 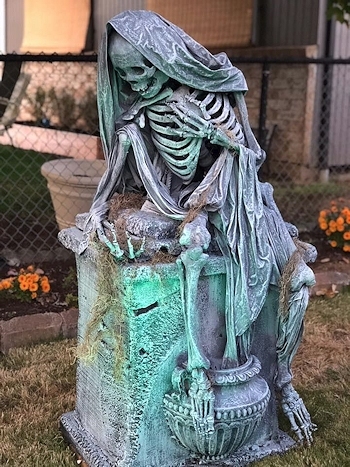 The skeleton tombstone was made by Witch Creek, but as soon as I have mine completed, I'll add it. 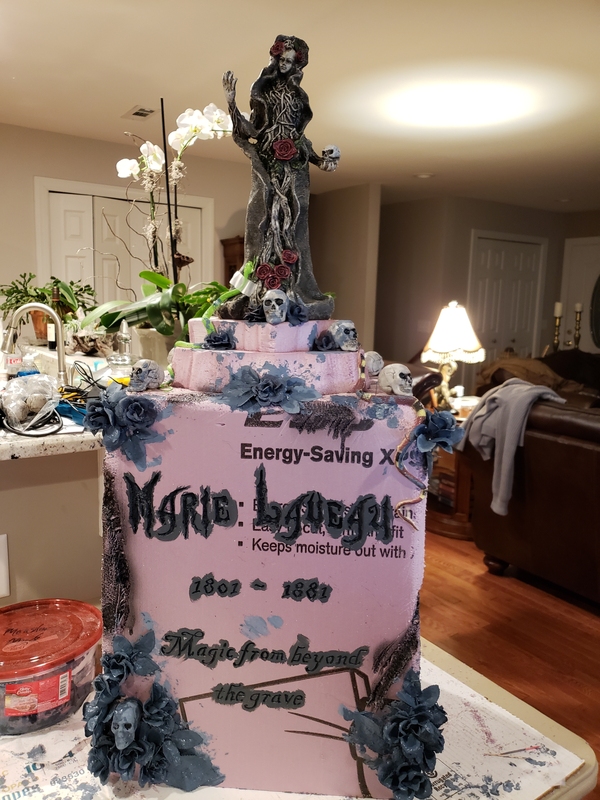 See pictures of the build and how she came to be named Marie Laveau. I haven't named him yet and I want to put a name on the stone somewhere... just not sure where. 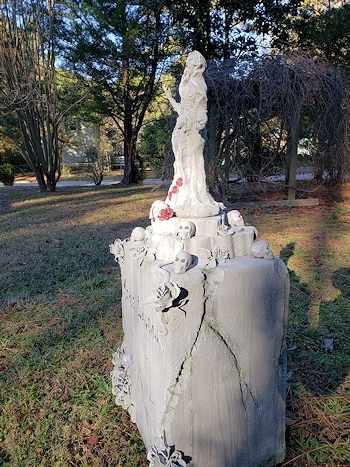 This picture is of the pedestal tombstone from Witch Creek. As soon as I finish mine, I'll post it instead. My inspiration for this stone is from Disney's Ma Ballard. I don't have permission to use the photo, so I'm linking to Pinterest, where it is located. 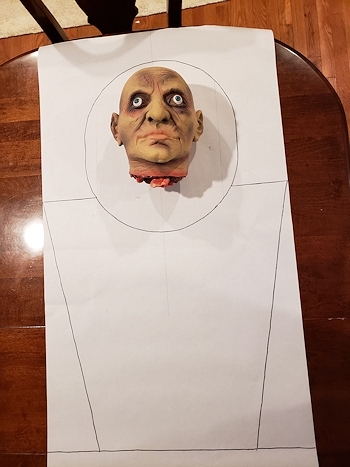 I got the severed head from Amazon. It's soft and will be easy to cut. I'm thinking the epitaph will be: Sadly, his last words were "Watch This"
If you have a better idea, please send it to me! The Angel tombstone is built off one of Tara's designs, but I'm not doing the skeleton movement in the back of the tombstone. 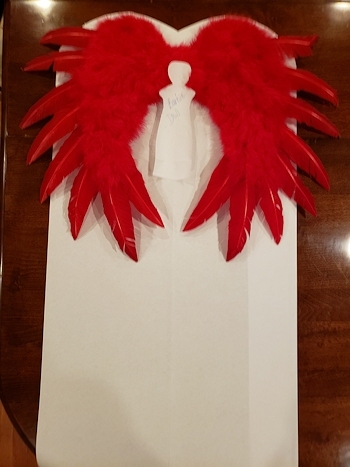 The larger feathers will be cut off and I have to find a "garage sale" Barbie doll this spring! Not sure what I'm naming her yet... but it will come to me, I'm sure! 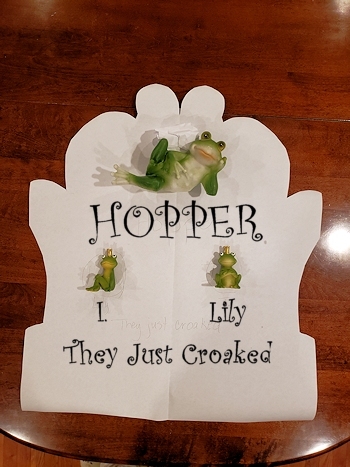 My husband found some frogs at Dollar General, so we have to create a frog tombstone. The names will be I. Hopper and Lily. The epitaph will be, "They just croaked." I'm thinking of cutting the stone in a "kinda" frog shape, but not too close. 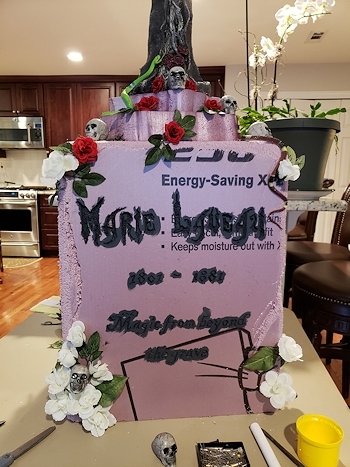 I found the statue at Michaels and thought it would be fun to make a tombstone with it. 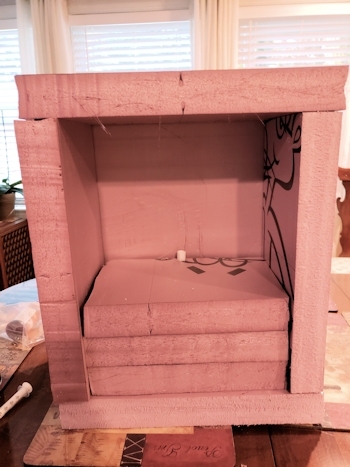 The base has three levels of foam inside. As you can see in the back, the pvc pipe is installed so the rebar can secure the stone to the ground. There will be one installed in the front as well. Once the front was glued on, I used wood putty to fill in the cracks and then sanded the stone until it was smooth. I scraped and cut the stone using my rasp to make the cracks & crevices. Placing the embellishments where you think you want them is important. This way, you get the look of the stone. If you don't like something, you can easily move it. I also placed the two top layers so I could see if I liked them and if they were sized to fit the top. You can see where I added the cracks & crevices to the sides and painted inside the letters. I keep a container of straight pins to anchor the embellishments. After dipping the flowers and leaves in monster mud, I pinned them on the stone. I used black spray paint to age the cracks and scrapes. The plastic snakes were a pain to glue on. I used straight pins to secure them, but the one on her dress had to be pinned at the bottom and taped to her dress until the glue dried. I decided that the font was too "frilly" to be easily read, so I used wood putty to fill in some of the serifs. After painting the stone a number of times with Dryloc, I thought it would be cool to paint a couple of the roses red. I also used some green acrylic paint to make the mossy look on the bottom of the stone as well as in the cracks. I decided to put a bit of red paint on a couple of the skulls. You could paint any or all of the flowers and skulls. I chose to paint the one in her hand, at her foot and one at the base of the pedestal. Why did I name her Marie Laveau? We're from Louisiana and lived a number of years in New Orleans, the Voodoo capitol of the US! Marie was a famous Voodoo Queen in New Orleans in the mid 1800's and was well known throughout the area. 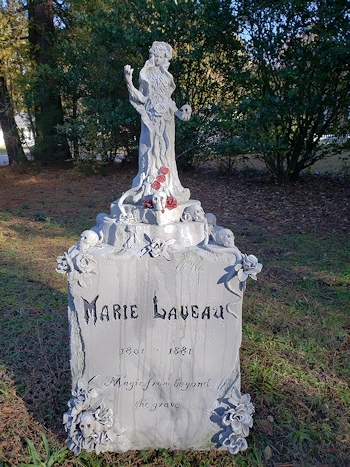 The dates on the stone are the dates she was born & died in the French Quarter. She is interred in a mausoleum in St. Louis Cemetery #1, where tours are directed to see her final resting place. The only way to see her mausoleum is with a tour guide, since so much vandalism has happened in the past. Some people refer to her as a witch, but she is properly described as a "Voodoo Queen." 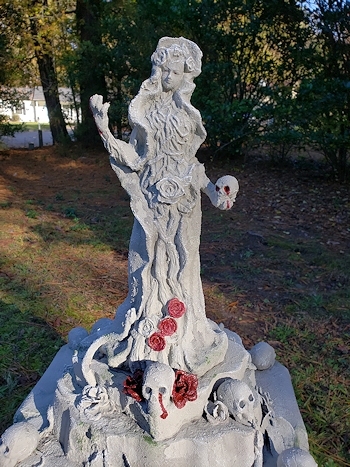 When I saw the statue with the skulls, I thought of her and thought it would be fun to do the tombstone.